Why do I do things like this? Why on earth would I accept a challenge to post one blog entry a day for the entire month of November? I’m still working out the whole NaBloPoMo page thing to have the posts RSS feed there but you’ll see my marathon posts here on mrsmetaphor. No sense reinventing the wheel, yes? This entry was posted in blog series, Ordinary Time, random musings, Uncategorized by mrsmetaphor. Bookmark the permalink. Cool! Says it all that the graphic on the logo appears to be my cat. Yeh, there’s a bit of a ruff thing going on, but only in the winter. His summer coat is thinner. 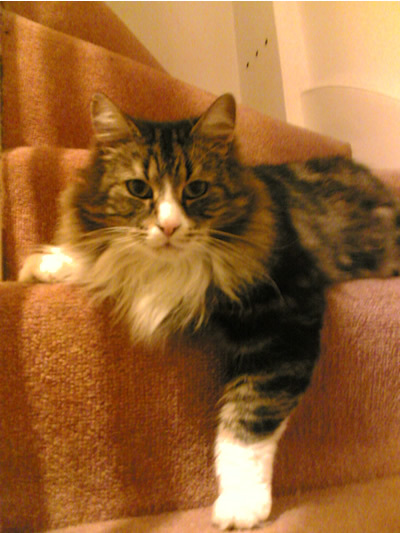 I have brush him every day, partly because as a bloke, he doesn’t really make too much effort but mainly because I strongly believe that a ball of fluff in the brush is worth two on the stairs. Even so, the house gets hairy very quickly. I sometimes think it’d be quicker to cut out the middle man and hoover him, instead. Oh, so that’s what the point of this NaBloPoMo is–making the internet explode. Thanks for clearing that up! LOL! Mrs, I love your avatar picture for NaBloPoMo, with the walls of books in the background. It is gorgeous! Thanks Fighting! Books are my passion….